The day after I posted Aerodynamics Part 2 about some small and free or relatively cheap things you can do to reduce air resistance and drag I came across this video. We’ve all heard that shaving your legs makes you faster. Does it? Check this out. Over the 40 km length of their trial runs, differences in how hard the rider is going over relatively short periods of time may well be sufficient to account for the differences they observed and they don’t address how, or even whether, they controlled for differences in effort over the trials with and without leg hair. From what you can see in the video it seems pretty clear they didn’t use physiological measures to control for effort. Looking at the set-up in the video I would guess average speed was used as a control but without more information no hard conclusions can be drawn. However, the magnitude of the differences they observed certainly indicate shaving your legs is something worth exploring further if you want to reduce air resistance and drag. You’re riding along at a speed that takes some effort. It’s difficult. What makes it hard? 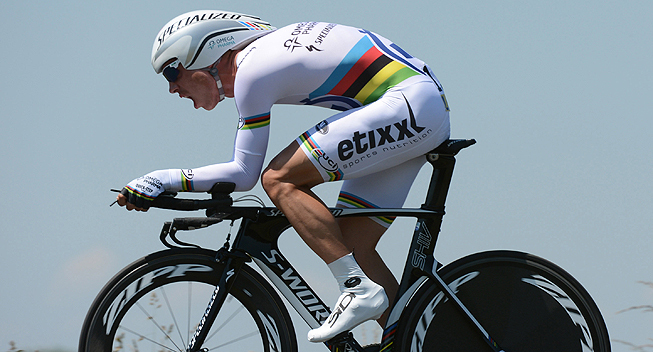 What do you have to overcome that is demanding all that effort to maintain your speed? You ramp it up and go faster. Now it’s even harder and it takes even more effort to maintain the faster speed. Why is it harder? What changed? 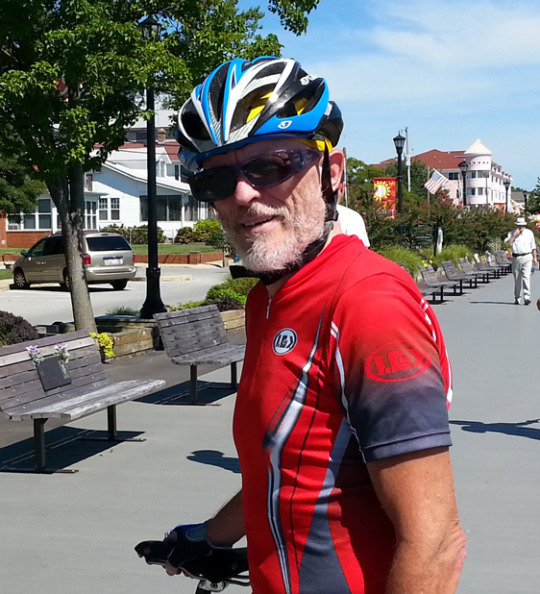 When you’re riding your bike there are four factors that resist your forward movement. One of them is gravity but gravity only comes into play when you’re going uphill. You have to provide enough power to carry the combined weight of you and your bike upwards against the earth’s gravitational field. You want to fly up the hill but the earth says not so fast. When you’re not going uphill, gravity is not doing much of anything to hold you back but it still takes effort to move forward and the faster you go, the more effort it takes. You’re fighting against three types of resistance: drive resistance, rolling resistance, and air resistance. They all take effort to overcome but air resistance is, by far, your biggest enemy. Drivetrain or drive resistance refers to the force you have to apply to overcome the mechanical resistance coming from the moving parts of the bike’s drivetrain. This includes factors like friction from the chain moving through the teeth on your front rings and rear sprockets and the bearings in the bottom bracket of your bike. If you’re pedaling, you’re producing drive resistance. You can reduce drive resistance by keeping your chain clean and well-oiled and by replacing the bearings in your bottom bracket when they wear out. Rolling resistance refers to the force you have to apply to overcome mechanical resistance coming from the parts on the bike that are not part of the drivetrain that are moving when you’re rolling down the road. This includes things like the friction of your tires on the road and the bearings in your wheel hubs. You can reduce rolling resistance by making sure your tires are not under-inflated and replacing the bearings in your wheel hubs when they wear out. Air resistance refers to the force you have to apply to displace the air around you as you move forward. When you move forward your body and your bike are moving into a space that was occupied by air. It would be nice if the air saw you coming and got out of your way but it doesn’t work like that. The air resists and has to be pushed out of the way. As we will see, unless you are climbing a steep hill most of the effort you are putting into pedaling your bike is being used to overcome air resistance. The graph on the left contains a lot of useful information about where your effort is going when you’re pedaling a bike. The graph shows how much power (measured in watts on the ordinate or y-axis) it takes to move a standard racing or road bike forward at different speeds (measured in kilometers per hour on the abscissa or x-axis). The graph assumes an average sized rider, on an average bike moving forward on a perfectly flat surface – which doesn’t describe any of us with perfect accuracy when we’re out riding our bikes. For this reason, the exact numbers shown in the graph aren’t what is important. When applied to you or me at any moment in time on a specific ride the numbers are likely to be a wee bit off. However the general relationships shown in the graph will hold for all of us all of the time. Three of the functions on the graph show the amount of power needed to overcome rolling resistance, drive resistance (labeled Drivetrain in the graph) and air resistance (labeled Wind). The fourth function (labeled Total) shows how much power is needed to overcome all three types of resistance combined. Read the graph by taking a velocity or speed shown on the x-axis and then seeing how much power must be applied to overcome rolling, drive, air or the total resistance at that velocity by the corresponding point on the y-axis. For example, at 12 kph (kilometers per hour which is about 7.5 miles per hour or mph) drive resistance is so small it barely registers and it takes about 10 watts of power to overcome rolling resistance and another 10 watts of power to overcome air resistance. Looking at power in terms of watts may not seem very useful if you do not have a power meter on your bike that tells you how many watts you are producing as you pedal. Another way to look at power is to think of it in terms of effort. What the graph shows as an increase in power measured in watts, can be understood as an increase in the effort it takes to ride at a faster speed. In other words, the higher the power requirement, the more effort you have to expend. What useful information can we get from the graph? First, note that the functions for rolling, drive and air resistance all increase with velocity. The faster you go, the more effort it takes to overcome each type of resistance. This isn’t very surprising. Everybody knows it’s harder to go faster and the graph just lets us know that it’s harder for three reasons: rolling, drive and air resistance all increase with speed. Next, consider the shape of the functions. The rolling and drive functions are linear which means they are very close to straight lines. This tells us something useful. The increase in the effort you need to expend to overcome rolling and drive resistance as you go faster remains roughly constant as your speed increases. For example, it takes the same increase in effort to overcome rolling resistance when you go from 8 to 9 mph as it does when you go from 18 to 19 mph. In other words, no matter what your current speed is, the same increase in effort will be enough to overcome the increase in rolling resistance when you go 1 mph faster. Now take a look at the shape of the function for air resistance. It curves sharply up; it’s not a straight line. This is not good news for the cyclist. It means that equal increases in speed (for example, an increase of 1 mph) demand an ever-larger amount of effort the faster you go. For example, it takes more effort to overcome air resistance when you go from 8 to 9 mph than it does to overcome air resistance when you go from 7 to 8 mph and it takes a lot more effort to go from 18 to 19 mph than it does to go from 8 to 9 mph. In other words, overcoming air resistance gets harder and harder the faster you go. When you get to the speed where the pros ride overcoming air resistance takes enormous increases in effort to produce tiny increases in speed. Overcoming air resistance gets harder and harder the faster you go. How quickly does the increase in effort needed to overcome air resistance ramp up? Looking at the effort needed to overcome air resistance as a proportion of the total effort expended can answer this question. At approximately 12 kph (7.5 mph) overcoming air resistance is taking about half of your effort with rolling and drive resistance accounting for the other half. As you go faster, overcoming air resistance demands a larger and larger proportion of your total effort. By the time you get to 25 kph (15.5 mph) approximately 70% of the effort you are putting out is being used to overcome air resistance. When you get to 20 mph (about 32 kph) roughly 85% of your effort is devoted to overcoming air resistance. And it just gets harder after that. 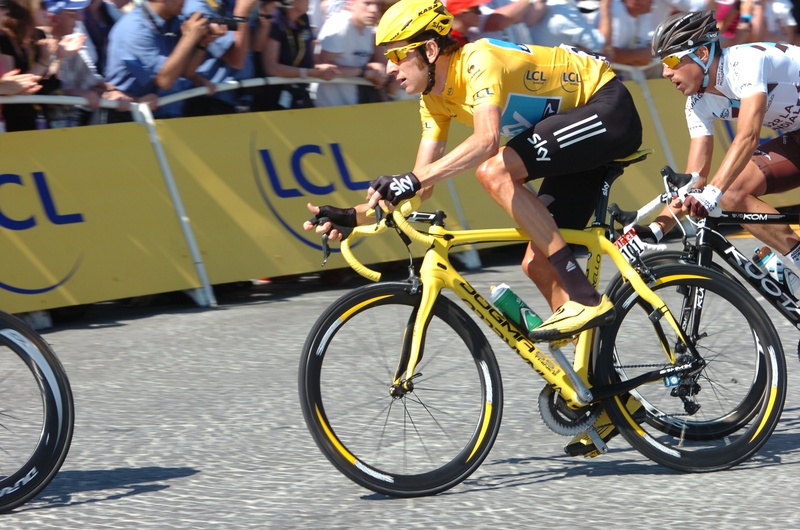 According to the UCI (the governing body for professional cycling) the typical average speed for a flat stage in the Tour de France is about 47 kph (29.2 mph). The power demands for overcoming air and total resistance are off the chart for our graph but from the information on the graph we can calculate that over 90% of the effort needed to maintain this speed is used to overcome air resistance. What would riding a bike be like if you didn’t have to overcome air resistance? 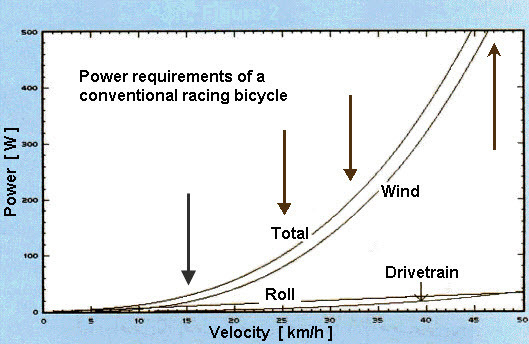 Reading from the graph, it takes about 100 watts of power to overcome the combination of rolling, drive and air resistance when you’re going 25 kph (15.5 mph). 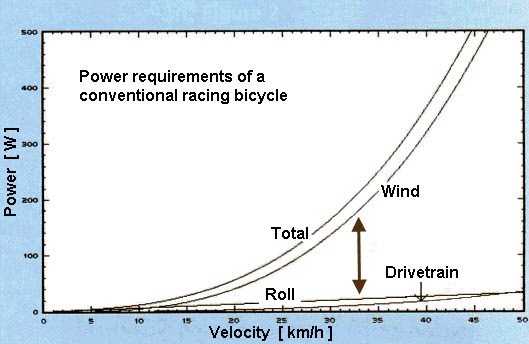 If you take air resistance out of the equation and imagine the linear functions for rolling and drive resistance extending beyond the 50 kph boundary on the right side of the graph and continuing to increase at roughly the same rate, that same 100 watts of power would be sufficient to move you forward (on a very rough estimate) at a speed of about 125 kph (77.7 mph). Okay, air resistance is the problem. What’s the solution? 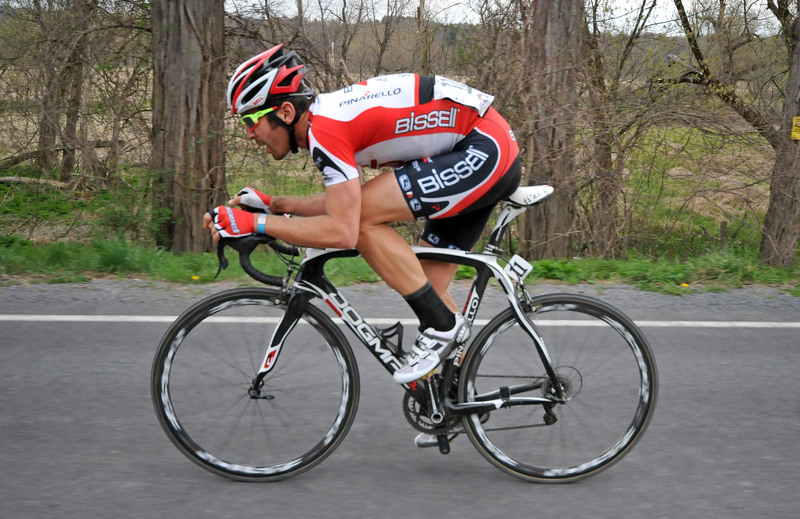 There are many ways to reduce air resistance such as riding in a full aero position on the bike which is both difficult and uncomfortable, spending tens of thousands of dollars on a high tech aerodynamic bike and a sleek aerodynamic kit, and some simple and much less demanding riding techniques that can provide small but significant benefits. We’ll examine some of these simple techniques in Aerodynamics Part 2.